PANMUNJOM/SEOUL, Aug. 13 (Joint Press Corps-Yonhap) -- South and North Korea agreed Monday to hold a summit meeting between their leaders in Pyongyang in September. The agreement was made during high-level talks on the northern side of Panmunjom that separates the two Koreas. They, however, did not unveil the date of the meeting. 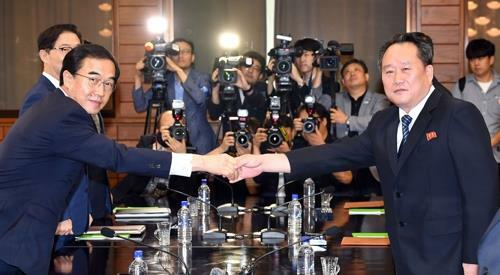 "We agreed to hold an inter-Korean summit within September in Pyongyang" the two Koreas said in a joint press statement issued after the meeting. North Korea's chief delegate, Ri Son-gwon, hinted after the meeting that the two sides agreed on a date but decided not to announce it, only to emphasize that the summit will take place "within September." The summit meeting, if held, will mark the third of its kind between South Korean President Moon Jae-in and North Korean leader Kim Jong-un following their face-to-face meetings in April and May. In the April summit, the two leaders agreed to meet again in Pyongyang in the autumn. Monday's talks came amid worries that the denuclearization process seems to have been in a stalemate since the June 12 summit in Singapore between North Korea and the United States. Washington and Pyongyang are accusing each other of dragging their feet in implementing what their leaders agreed on at the historic summit. The U.S. has urged the North to speed up its denuclearization efforts, while the North has argued that the process should be carried out in a simultaneous and phased manner. Pressure appears to be mounting on South Korea to play a constructive role in breaking the logjam in talks on North Korea's nuclear weapons program. During Monday's talks, the two Koreas also discussed what has been implemented since their previous summits, especially on their promised efforts to expand cross-border exchanges and cooperation. They have been at odds with the speed and scope of inter-Korean exchanges, though there have been a flurry of talks on details on cooperation in various areas, including railways, roads and sports. The North has voiced frustration with the slower-than-expected pace in progress on those fronts. The Seoul government appears reluctant to push for full-blown cooperation with the North, constrained by multilayered sanctions imposed on Pyongyang. "We reviewed the implementation situations of the Panmunjom Declaration and held consultations in a sincere manner on matters related to its more active enforcement," the two sides said after the high-level talks, referring to the agreement reached in the historic April summit. South Korea's delegation was led by Unification Minister Cho Myoung-gyon. His North Korean counterpart was Ri, chairman of the Committee for the Peaceful Reunification of the Country. Also included in South Korea's four-member delegation were Vice Unification Minister Chun Hae-sung and Nam Gwan-pyo, a senior director from the presidential National Security Office. The North's delegation included Pak Yong-il, vice chairman of the reunification committee, Vice Railroad Minister Kim Yun-hyok and Pak Ho-yong, vice minister for land and environmental protection. The meeting was the fourth such talks so far this year. They last met in June. Monday's talks started in a friendly atmosphere as the two sides voiced optimism for the results that their meeting could produce. "In a practical perspective, this is a grand turning point for our inter-Korean relations," Ri said at the start of the meeting, citing a flurry of talks and exchanges since early this year. He also said that the two Koreas have become intimate "friends" with complete understanding of each other. Cho expressed hope for better relations between the two Koreas, saying that any differences would be tackled when the two Koreas keep "the same mind."